Control charts are charts that plot some sort of quality measurement, for example number of defective goods in a batch or the weight of packets of food. The measurements are then plotted over time to see if there are any patterns. I won't go into too much more detail, because this is not the place for it (and I don't want to bore anyone that already knows it!). You then draw "control limits" - lines above and below the average and then investigate any points that fall outside those lines, or meet some criteria. What those criteria are, and where to set the control lines are dependant on the quality control system you have in place, and the type of data etc. Lean Six-Sigma is perhaps the most famous set of rules for determining when to take action. X number of points increasing each time. It's fairly easy to create a control chart with the limits, but a bit more complicated (judging from questions I get asked) to highlight every single point in a "run" that has violated the pattern, especially dynamically (as in not in the script). It's easier to just mark 1 (the start or end). So how do you highlight "X points in a row"? Here is a Qlikview example document of a control chart that I have created using pretend data. The data is pretending to be measurements with a mean of 15 and SD of 3. The first chart is a moving average chart. The moving average was also used to create thetolerance zones on the main control chart, which is the second one. For each pattern, to keep things simple, I start by using a cumulative expression in the chart that can be referenced else where, but is not displayed by unticking any of the "line / bar / symbol" options. ie, look ahead X points and if we are in a chain long enough, then the miminum value will be -X points or less. Feel free to have a play, and better still turn my chart into table to see all the expressions working for yourself. I hope this makes it clear, this was harder than I thought to explain in a blog! Please download the example and have a look for yourself. Interesting thing I noticed: while playing with the Above() and below() expressions - they don't work if you include fields that are also dimensions in the same table (or chart). Anyone else noticed that? Nice Post. Thank's for Sharing! Thanks. Let me know if I've explained everything well enough! This is great. Have you created p-charts, u-charts and x-bar charts in Qlikview with rule firing capability? 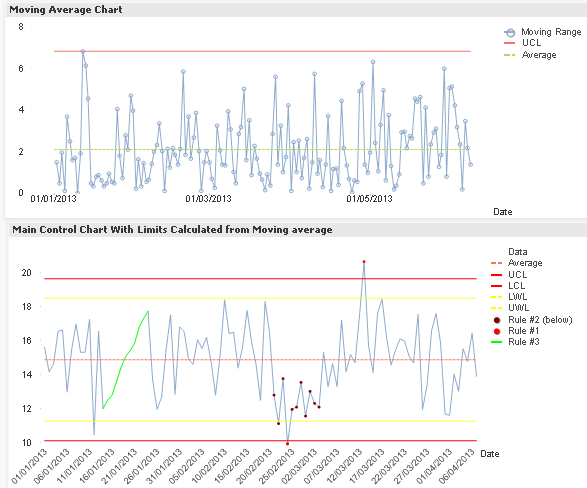 I would love to create those in Qlikview.. we use control charts extensively at my hospital. This is a great post. Thank you for sharing and look forward to your future posts. Thanks Tim. I've created p-charts but not with rules, are they generally any different to the above? Good idea for a future post I think! I have created a p-chart, i-chart and an xbar chart with the rules you have described. Yes they are all similar, although there are other rules i'd like to implement. Maybe we can collaorate. Cool, what kind of rules are you looking at? Thanks for sharing Erica. Nice post! It was a helpful post. In addition to what you have discussed, I am looking to create control charts where the control limits shift based on the trends ie., if there are 6 or 7 consecutive points on either side of the existing control limit, new limit should now be calculated with the new points. I have really no idea how to implement this. It would be great if you can help me with this stuff!!!! Great post, i am looking forward to implementing this. Hi Erica, Do you have any idea why for rule 1 and rule 2 it shows as a line when there is more than 100 dates displayed in the chart? For example if you filter for dates > than 8/2/13 it displays rule 1 and 2 as a line, if you then filter dates > 07/2/13 it then displays as a dot which is the intended scenario. The cut of seems to be 100 but i can not figure out why? Nb : this is user specific in the software and is also a separate setting in the server so you will need to check that before publishing. Sundanania -will check when I get back to a version of QV! hey, that did the trick (settings>>user preferences>>objects). THANKS!!! look forward to hearing peoples thoughts. Fantastic - answers a bunch of questions I have had for a while. just one issue - the average I m using is being calculated dynamically too - so how do I get it into the equation above?